Published in the Press Enterprise : March 3, 2016 Updated: 4:34 p.m. Growing up in the 1980s was inspirational for Monica Landeros. Landeros spent many summers at her aunt’s family business. “I had an endless supply of scrap fabric, buttons, trims and loud 80s pop music to inspire what would later become an avant garde fashion aesthetic,” she said. Believing it to be her next natural step, Landeros obtained a certificate in fashion design from Los Angeles Trade Technical College. She went on to receive a B.S. in Art from Atlantic Union College and a M.F.A. in sculpture from California State University, Fullerton. 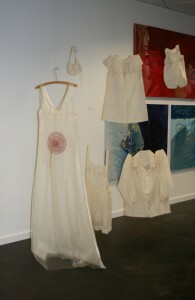 Landeros creates garments to use as canvas, layering them with stitching, fabric and objects. She will often place items in groups or in close proximity so they work with each other to make a point or convey emotion. Her work has been exhibited at the Riverside Art Museum, Division 9, Millard Sheets Gallery in Pomona and the Lowe Gallery in Santa Monica, among other venues throughout Southern California. But in 2005, Landeros stepped away from her art career after receiving her graduate degree. The pieces Landeros created were five articles of clothing entitled, “Heart beats.” She said the garments symbolized a father, mother, two children and an infant. She stitched a bright red heartbeat on four of them. “On the infant’s garment I stitched a heartbeat that flat lined,” she says. Landeros, mother to two children and an elementary school art teacher, has gone on to participate in “Hanging Out,” the 2015 incarnation of Ossman’s project at the Afterimage Gallery in Riverside. Currently, she is a lead artist in the most recent version of “On the Line,” for which Ossman received support from the National Endowment for the Arts. In a partnership developed by Ossman with the Riverside Public Library, the first of three one-day exhibits takes place Saturday, March 5 at the Arlanza branch. For more information about “On the Line,” visit ontheline.ucr.edu. Patrick Brien is executive director of the Riverside Arts Council, a private, nonprofit corporation. Contact the council at info@riverside, 951-680-1345 orriversideartscouncil.com.